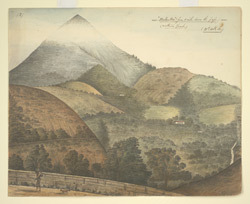 Water-colour painting of Kalhatti, near Ootacamund (Udagamandalam) by George Hutchins Bellasis (1807-1862), 21 October 1851. This view shows the mountain with its summit veiled in mist; in the foreground are wooded hills. Inscribed on the front in ink is: '(2) 'Kulhuttee' (from 1 mile down the pass.) (northern Ghaut.) (21st Octr. 51)'. Depicted in this image are the characteristic green, rolling downs of the Nilgiri Hills in the south of India. The scenery is reminiscent of much of Europe and Udagamandalam became a popular resort for European people escaping the heat of the Indian plains in the 19th century. Udagamandalam was the summer headquarters of the government of Madras from 1861 onwards and rapidly became a popular sanatorium and retreat for invalids.